Each Tuesday, we share a list of ten highly-rated charities. A few weeks ago we shared our top ten dog charities. 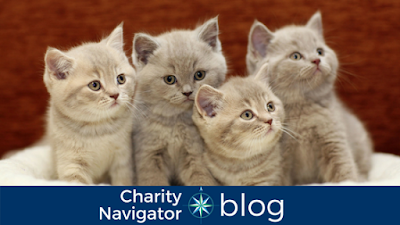 Today, we’re sharing our top ten cat and pet rescue organizations. Save-A-Pet Adoption Center, founded in 1972 by Gertrude Maxwell, is a no-kill shelter dedicated to finding loving, quality homes for each cat and dog in its care. Pets are sheltered indefinitely. Our shelter strives to create an environment which enhances both awareness of and support for the humane treatment of animals. We provide comprehensive services including: a caring and safe haven for cats and dogs, medical and behavioral assistance to mend broken spirits and bodies, adoption services, long term care for residents who are not adopted, community education, community leadership through alliances with other humane organizations, and community referral to low cost spay/neuter services. killed in public facilities and find them new, loving homes. For 50 years, our staff and volunteers have been committed to doing everything in our power to save as many animals as possible. chipped and fully vaccinated before being put up for adoption. Pets In Need provides free spaying and neutering for the pets of all California residents. We receive no government funding; we are completely supported by donations from the general public. Pet Adoption Fund is an all breed, 501 (C) (3), Non-Profit, No-Kill Dog & Cat rescue and adoption organization founded in 1983, and it is located in the city of Canoga Park, Los Angeles county, CA. We are staffed primarily by volunteers, and exist solely on donations. Our mission is to rescue, shelter, and find loving permanent homes for the many wonderful, yet previously abandoned, neglected or abused companion animals. Since our inception in 1983, we have cared for, rehabilitated, and found responsible and happy homes for the thousands of pets who have come through our doors. Pet Partner's mission is to improve human health and well-being through the human-animal bond. Pet Partners is the national leader in demonstrating and promoting positive human-animal interactions to improve the physical, emotional and psychological lives of those we serve. Our 15,500 volunteer therapy animal teams make visits across the nation, and interact with a wide variety of clients including veterans with PTSD, seniors living with Alzheimer's, students with literacy challenges, patients in recovery, people with intellectual disabilities, and those approaching end of life. Pet Partners teams help people become healthier and happier through incorporating animal assisted activities into their lives. Austin Pets Alive! fills critical gaps in Austin's animal live-outcome rate by identifying the key groups of animals that are typically euthanized in a shelter setting and maintaining comprehensive, innovative programs to address the problems these key groups face. Using best practices from around the country, APA! developed programs to care specifically for these groups, thereby reducing their staggering over-representation on euthanasia lists and directly increasing the city's save rate. Pet Helpers is a private, Adoption Center and Low Cost Spay/Neuter Clinic that services communities across the Lowcountry. Our mission is to end the euthanasia of all adoptable cats and dogs by keeping all animals until adopted; providing low cost spay/neuter surgeries; offering humane education programs; pursuing animal cruelty prosecution; and initiating animal welfare legislation. You can use Charity Navigator's Advanced Search Tool to find even more highly-rated cat and pet rescue organizations.